An Alberta school division has voted to defy the education minister and not submit a policy on transgender and other sexual minority students. Clark McAskile, chair of the Fort Vermilion School Division, says the decision was made unanimously by the board at a meeting on Jan. 18. "We just felt there was no need to change the policies that already provide for that level of tolerance and understanding," McAskile said Thursday. "We feel we do a very good job of caring for our students and providing for their educational needs." Alberta's 61 school boards have been directed by Education Minister Dave Eggen to write draft policies to make schools safer and more accepting of LGBTQ students. The drafts are due by March 31. Eggen said he is aware of the situation in Fort Vermilion and will work with the board on its draft policy. "I'm meeting with the Fort Vermilion school board very soon and I'm looking forward to that in the spirit of what we're trying to do here, to help vulnerable children," he said. "It's not meant to be an adversarial process." McAskile said he welcomes the discussion. "Our meeting with the minister may very well shed new light on some issues that we hadn't considered, or our point of view may give him some areas that he hadn't considered either," he said. The Education Department said there haven't been any other school divisions declining to work with the province. 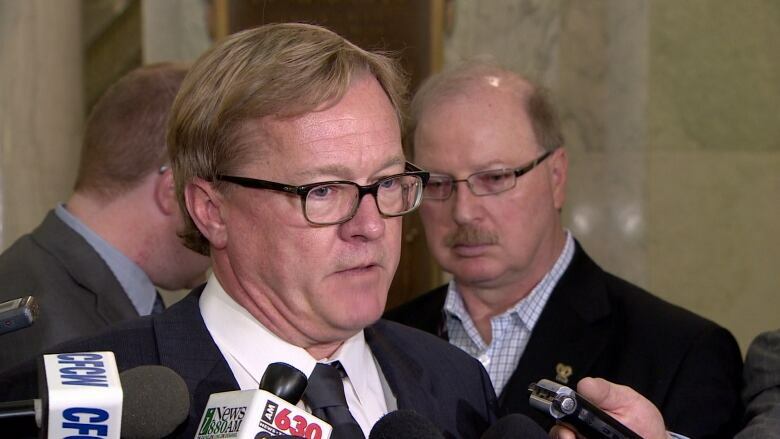 Eggen has a number of options to sanction school boards that do not follow government directives. One is to dissolve the board, but the minister said he is not considering that with Fort Vermilion. "Dissolving is a very extreme provision," said Eggen. Fort Vermilion is a sprawling, public school division tucked away in the northwest corner of the province. It includes the municipalities of High Level and Fort Vermilion. The department has handed out 12 guidelines it expects to see reflected in the policies. They were sent a month ago and have become the focus of heated debate. Suggestions include allowing students to join sports teams, dress and use washrooms based on their sexual identity or on what they perceive their gender to be. Schools would not be allowed to inform parents of a student's decision on those matters. Eggen has declined to say which, if any, of the guidelines must be strictly adhered to, which can be honoured in a conceptual sense and which can simply be honoured in spirit. McAskile said that has led to questions from trustees. "There was some concerns with how specific the guidelines were, especially when it came to change rooms, sports teams, some of that stuff. Those things probably would not be well accepted by the parents," he said. He said the guidelines may also lead to construction changes that could be difficult to implement on tight budgets. Some of Alberta's Catholic church leaders have been highly critical of the guidelines, which also affect Catholic schools. They say church teachings state that one's sexuality is a God-given gift and to alter it is to challenge divine will. They also say Catholic schools already provide safe, caring environments for all students.